A lot of things are doing just fine in France, but the economy isn’t one of them. It’s burdened by a public sector that never ceases to bloat. In 2013, government spending, despite any overt efforts to limit it, grew to 57.1% of GDP, a record within the Eurostat data series for France, and up from 52.9% in 2002. In the past, when the economy slowed down, the government would spend more through its public services and its vast network of state-owned enterprises. The money would flow into GDP and everything would sort of look pretty good. To fund these policies, the Bank of France would create the money, and the franc would be devalued constantly and “revalued” periodically, most recently in 1960 when three zeroes were chopped off. Whoever owned any of this fancy-looking paper, or financial assets denominated in it, for too long would end up holding the bag. Now France lives in a different world, the Eurozone. But it hasn’t quite adjusted to it. It can’t print its own money (though it desperately wants to). And when the government wants to spend more than it takes in, there are suddenly treaty-based limits, which it keeps transgressing. But the private sector is being asphyxiated. So in the second quarter, the economy was mired down at zero growth – same as in the first quarter. Consumption was up 0.5%, which is good, but it only drove up imports (+0.4%). Exports stagnated, manufacturing fell 1.0%, corporate investment declined 0.8%, and housing investment plunged 2.4%. The plunge in housing wasn’t a blip. And it’s occurring even while people scream about shortages of housing in Paris and other urban areas, or at least shortages of affordable housing, to which the government has responded with numerous elegant policies, like trying to force owners of vacant apartments to rent them out. Demand for housing is there. But where is construction of housing units? 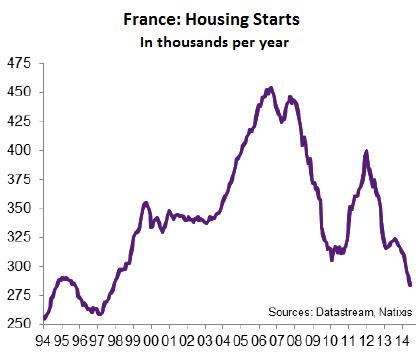 This chart (by Natixis) of French housing starts from 1994 to 2014 shows how housing construction has been caught, despite strong theoretical demand and a growing population, in a terrible downdraft. By comparison, housing construction in the US plunged too after the bubble blew up and hasn’t recovered, but it plunged because the housing bubble had spawned feverish overbuilding that led to an excess of supply. That has never happened in France; the plunge in housing construction has other causes. Whatever these causes, the plunge is dragging down the entire private-sector economy. 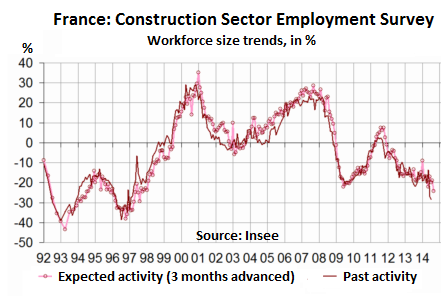 The French statistical agency Insee, as part of its monthly construction industry survey, reported on the terrible employment trends in the sector (commercial and housing construction). The survey asks companies, from the smallest entrepreneurial outfits to the largest construction behemoths, about their hiring trends and expectations. A good measure of the health of the industry. The survey results (seasonally adjusted) show that construction employment took a terrific dive during the financial crisis. It bounced back in dead-cat manner to where employers were briefly adding workers in 2011, giving rise to a lot of false hope. But it has now deteriorated below the low of the financial crisis. Note the prior low points in the 1990s, when things were really tough in France at the end of the socialist Mitterrand Era and at the beginning of Jacques Chirac’s reign. It was a time when unemployment set new records that shook up the country and caused uproar in the streets. France is bankrupted by its millions of worthless automobiles, that destroy irreplaceable capital leaving nothing in return but debts and highway deaths. As long as one car runs in Europe the entire continent will continue its irrevocable slide into the pit: France will become Greece, then it will become Syria and from there a failed state = Somalia: one lousy stinking car. The continent has ruined itself borrowing to buy fuel, now it cannot repay because there is nothing that can be done with the fuel that is remunerative.